At Fespa Global Print Expo printing manufacturers showcased their latest technologies and applications for the global specialty print market. Print service providers (PSPs) and sign-makers gathered to see the latest technology, equipment, consumables and materials from both leading brands and smaller businesses. 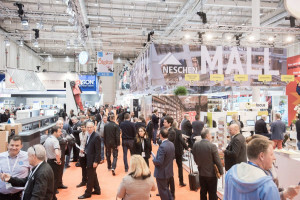 FESPA will host over 650 exhibitors across ten halls at Messe Berlin. Exhibitors showed their latest technology, equipment, inks and materials for digital and screen wide format printing and signage applications. Digital print highlights include HP’s industry debut of its Latex R Series. It is the first true hybrid technology combining HP’s flexible printing capabilities into rigid printing, as well as the introduction of its breakthrough HP Latex white ink. Mimaki showcased its new UCJV300-160 series, which was introduced in September 2017. Mimaki’s first foray into the 3D printing market, the 3DUJ-553, will also be on display. Fujifilm will present two new high end platforms. The super-wide format platform, the Acuity Ultra, and the Acuity B1 modular system, which was previewed at FESPA 2017. 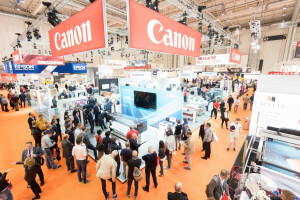 FESPA 2018 marked the first opportunity in Europe to see Canon’s new elevated printing solutions for its Océ Arizona series. 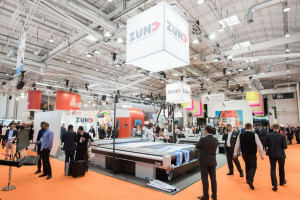 Zund will showcase the numerous applications possible with its digital cutting systems and workflow solutions. There was also be an array of inks for multiple applications on display, including the latest screen, inkjet and flexo inks from Nazdar Ink Technologies and new products from Sun Chemical for screen, digital, textile and industrial printing. For visitors interested in industrial printing, ESMA hosted an Industrial Print Showcase. The Showcase highlighted a variety of samples provided by ESMA members and their customers. Application examples included printed flock wallpaper, printed and flock glass, membrane switches, digitally printed interior décor items, 3D printed objects and direct-to-shape printed PET bottles. The Showcase also included samples from Fimor, which show how the combination of inkjet and screen printing can produce decorative, protective and functional features. For the first time FESPA has grouped its media exhibitors in one dedicated substrates hall. 70 exhibitors presented their substrate innovations, including ten new films from Avery Dennison and Mactac. Lintec launched a recycled film for screen and digital applications and Brunner introduced new products to its own brand, ImagePerfect range.